Dreadlock hair extensions are increasingly popular for people who want an alternative look. From African Americans to Afro Europeans and Anime to Gothic fans. These hair extensions come in all lengths and all colours. This pretty much comes down to the look that you’re after. But rest assured you can by hair extensions for dreadlocks in the full spectrum of colour – and you can see from the colours on this page that they can be ordinary or extraordinary! If you're not sure which colours would suit you then check the hair colour chart article which also outlines the colours that complement different skin tones. How Much Dreadlock Extension Hair Will You Need? This comes down to how thick you want your hair. When folks around these here parts have worn dreadlock hair extensions they tend to stick to 2 – 3 packets of synthetic hair as anything more become more bulky than most people like. 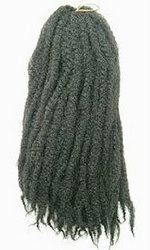 If you’re using the jumbo wool dreadlocks then two packets (each containing 20 dreads is more than ample). The key thing to remember is that double ended dreads count as two dreadlocks on your head so if there’re 20 in the packet that’s 40 dreads on your head. How Are Dreadlock Hair Extensions Attached? You can buy dreadlock extensions for weaving, in which case, net weaving is handy attachment as is is track weaving. Bonded weaves for dreadlock extensions is not suitable (it's not impossible, it's just not suitable unless you're able to have your growth hair canerowed (cornrowed) in a very taught (but not tight) manner. There are several non-weave methods. If you prefer to braid and leave the rest free, then the standard method is the same for braiding ordinary hair extensions. Fold the lock in two, use a section of your own hair as the third strand and begin to braid. If you have Afro textured hair you can just braid to the end of your hair and leave it as the texture will mean it doesn’t unravel. Dreadlock extension wrapping method - ALWAYS TWIST YOUR OWN HAIR BEFORE WRAPPING HAIR EXTENSIONS AROUND IT. This method involves wrapping the hair extensions around your natural hair. Although the image doesn't show this, your own natural hair must always be braided or twisted before being wrapped in hair extensions. 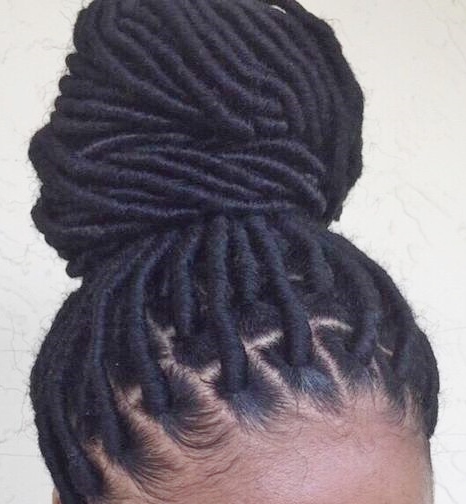 You can braid or twist your own growth hair or you can incorporate hair braiding extensions into your twist if you would like thicker (wrapped) dreadlocks, but it must be twisted first. What happens if you don't twist your hair before wrapping it? It depends on how long you wear your dreadlock hair extensions, how you maintain them and the texture of your natural growth hair. However the long and short of it is that there's is a high probability (risk) that when you come to remove the dread hair extensions, you'll find that your growth hair has matted together... yes that's right folks, you'll have inadvertently created actual dreadlocks with your own natural hair as it will have become matted inside each of the wrapped dreadlock hair extensions. If you only wear them for a couple of weeks (without twisting your natural growth hair), matting and locking is unlikely to happen, but if you wear them for a few months, then the likelihood is much greater. If you have European textured hair then a small rubber band can be placed at the end of your growth hair in order to stop the braid from undoing itself. The other method is to use two sections of your own hair, wrap those two sections of your hair around the middle the dreadlock to hold it in place, (keep the other half of the dreadlock away from this part with a clip). Begin to braid using the bottom end of the dreadlock. Once you’ve braided to the end of your own hair, you can then seal it with a rubber band and unclip the other half of the dreadlocks and hey presto you have two dreads from one braid! Dreads are a great way to jazz up your look. They require care like any other hair extensions and you can learn about caring for your dreadlock hair extensions here. There's more information in the Hair Extensions Q&A section as well as the navigation menu, or if you'd like to keep up to date with the next guide about hair weave, hair extensions, wigs and hairpieces then join our blog – no personal info required.